Wedding colours are usually one of the first foundations of wedding styling that you lockdown, as they’re an important basis for your bookings in loads of other aspects of the wedding too – that’s why they’re so early on in our super useful wedding checklist! It’s the kind of detail that is incredibly easy to get caught up in (does it really MATTER if one of them is turquoise and one of them is baby blue? ), but, counter-productively, it may feel like wedding colours need to be completely decided on beyond all doubt before you can move on to make any other detailed decisions. 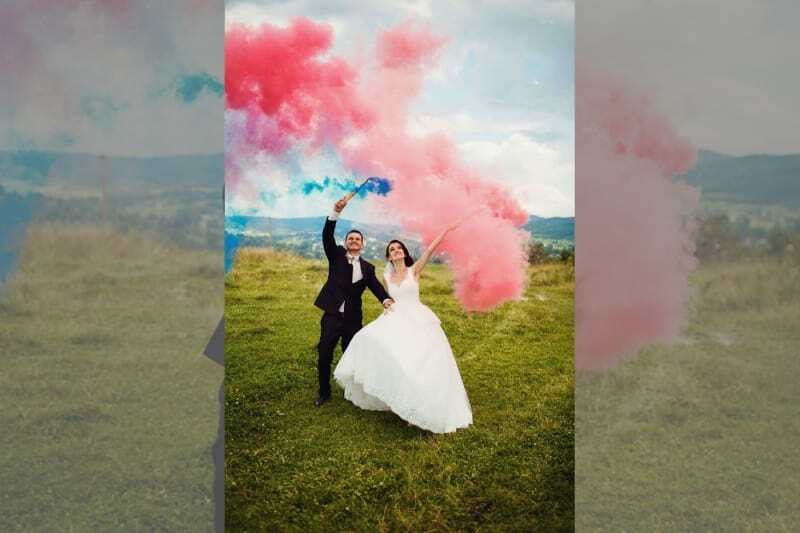 Fret not: we’ve compiled a list of things to think about in order to choose your wedding colours and choose them right. Where are you holding your wedding? That’s the first question you need to ask yourself when delving into the world of wedding colour palettes. If you want to go wild with very specific colours that mean something to you, or bolds and brights, use our wedding venue search tool to search the largest wedding directory in the UK and find somewhere that can serve as a blank canvas for you to really make your own. Alternatively, if you’ve already got your eye on a venue that already has a certain style, think about the colours so that highlight and compliment the best features of your venue. Finding a venue can be the cornerstone moment of wedding planning for some couples, for others, their favourite flowers, the wedding dress or the ultimate bridesmaid attire can be the deciding factors in choosing a colour scheme. So if you have certain must-haves, without which you can’t imagine your wedding, get those scribbled down. Draw inspiration from your chosen wedding season. Pastels can work well for winter, jewel tones will look fantastic in autumn, so feel free to experiment with textures and different shades! What kind of wedding do you want? If you’re after a feeling of luxury and drama, then go for darker and richer colours. If you are a fan of a romantic atmosphere, lighter shades will look perfect. Look in your home and wardrobe for colour inspiration. The colours that dominate there are obviously the ones you love. Bonus: the wedding photos that will take their place on the mantelpiece will even match your home – now that’s planning! Keep your options open and look around before settling on a palette. Hit up Pinterest or our Real Weddings section for inspiration. While we don’t advise you to chase the latest trends and fashions, you can always throw in a hot new colour as an extra detail to your wedding. We’re going to get technical here so grab a colour wheel. The basic rules for colours are that cool and warm colours go well together, as do colours which have the same primary colour base. Within that, you can pick an analogous colour scheme, with three colours located next to each other on the colour wheel, or you can choose complementary colours, which sit directly opposite each other on a colour wheel. Alternatively, you can go for monochromatic colours, which are a number of different shades taken from the same hue. Our general rule for choosing wedding colours is to have at least one neutral colour which your guests’ eyes can rest on to balance the bright colours in your palette. And there you go! Every year, Pantone releases its “Colours Of The Year”, a list that attempts to predict the colours that will be everywhere in the coming year. The irony is that this list often decides what the predominant colours will be the next year, and thus what’s readily available from suppliers and shops. Do you remember 2016 being awash with a light, warm pink and cooler, forget-me-nottish blue? That was Rose Quartz and Serenity Blue. This year it’s the vibrant Greenery. They release them in December, so keep an eye out for them – if its a colour you like, your styling just got a whole lot easier. Needless to say, when choosing wedding colours, choose shades that are easily wearable, especially if you want the bridesmaids to carry the majority of colour – and talk to you again! Sneaky tip: don’t overdo the colour on your wedding cake. We suggest you use small details and occasional pops of colour to make it look epic. Did you enjoy this article? Here are some more suggestions for you!